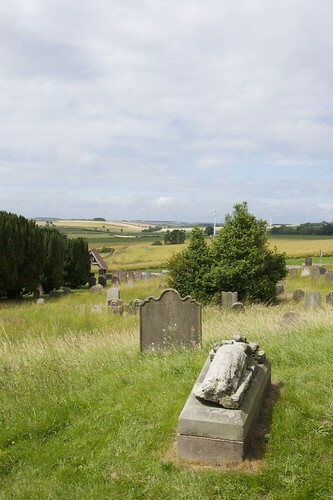 Theogeology is an exciting new academic discipline, focussed on trying to understand what building stones old churches were made from, particularly in the Ryedale and Wolds regions of North and East Yorkshire. Weaverthorpe and the Wolds, Ryedale, North Yorkshire. It began a few months ago, when buildings archaeologist Dav Smith, a dilettante geologist (myself), and a couple of our friends, went out onto The Street in the November rain. There are some smashing old churches along that Roman road, but most of them were rebuilt in the 19th Century. For his doctoral thesis, Dav worked on ascertaining what the original churches would have looked like, and he asked me to help with the identification of their building stones. All Saints, Appleton-le-Street, North Yorkshire. As is my wont, I made some wild and ill-informed speculations about the Upper Jurassic geology of the area, and tried to identify the religious rocks in question. I wasn’t of great use, but we all agreed that theogeology a very pleasant pursuit. So, when I received a vaguely similar enquiry from Carolyn Twomey, who is researching the Norman fonts of Britain and wanted to visit the north-east Yorkshire ‘group‘ of Norman fonts to see what they were made of, Dav and I happily agreed to put our theogeological hats back on.